The party goods, decorations and refreshments are in the basement. The customized cake has been ordered. The invitations for your special needs child’s high school graduation party are in the mail. And in a few weeks, family and friends will join you to celebrate this wonderful and joyous occasion. Now there’s only one thing left to do. Close your eyes, take a deep breath and allow yourself to take it all in. Life is all about change. Reaching new stages or opening new chapters can be very exciting but also a little scary. Leaving the known behind and entering new territory can be an unsettling experience, even with fresh potential for growth and success ahead. 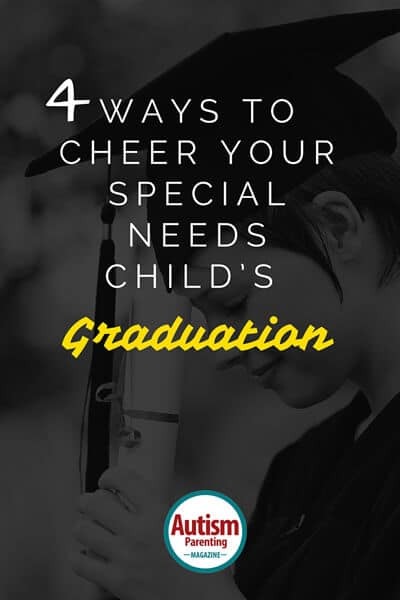 That’s how high school graduations can seem to parents of special needs children. You are leaving the comfort and security of the familiar school experience with your children. Now, together with your son or daughter, you must adjust to the new environment of a more adult, community centered and/or work-oriented world. But, whatever lies ahead, you can take tremendous pride in getting to this milestone in your child’s life. Your son or daughter is graduating from high school. Wow! What a great accomplishment – for the both of you. When your son or daughter was first diagnosed all those years ago, you didn’t know what to expect or what the future held. But you took a giant leap of faith and walked on, even though it meant braving uncharted territory. And, over the years, you’ve learned that raising a special needs child is not easy. Managing all aspects of your child’s daily living – including personal needs, school activities, therapy and medical appointments – can be overwhelming. Balancing job and family responsibilities is stressful. There have been plenty of sacrifices along the way. You’ve probably put your personal and professional needs on the back burner, more often than not. But because of your determination and hard work, your child will have a better life. And his/her graduation is a major step in this direction. That’s worth patting yourself on the back about. Think back to when your son or daughter was around five years old and just entering the school system. You were most likely anxious and unsure of what would happen. And you probably thought you’d never figure out the complex and bureaucratic world of special education. You had to navigate an educational system that was vastly different from your own when you were growing up. You learned new terms for teaching as it pertains to special education; ABA, sensory integration, fine/gross motor skills and IEP meetings, to name a few. And you got to know a host of new teaching professionals, such as physical, occupational and speech therapists as they worked with your child. Now look at you today! You’ve become an effective, parent advocate. Most importantly, by actively participating in your child’s schooling and being a full partner with the teaching team, you’ve given your son or daughter a solid education and put him/her on the path to a brighter future. As with most parents, you just want to give your child the best life possible. It’s easy for any parent to get hung up on the future. Some put enormous amounts of effort into getting their kids into the right pre-school that will lead to the best public school, the best high school and set them up for Harvard University—all when they’re three years old! Managing future expectations for any child is difficult, but can be even more so for special needs parents. After high school, your son or daughter may transition to a day rehabilitation, vocational training or volunteer worksite program. Your child will have new personal and/or work-related goals to achieve as they build upon the foundation they received in school. However, there will be new issues and challenges to deal with and overcome as they adjust to adulthood. Even though, this may not be the life you dreamed of or wanted for your child, don’t let it discourage or depress you. So what if your child isn’t going off to an Ivy League college or starting an entry level job at a prestigious, Fortune 500 company. It doesn’t diminish what your son or daughter has accomplished or can achieve in the future, with your continued love, support and guidance. Graduating from a specialized school is no walk in the park and your child did it. She/he worked diligently and consistently on their demanding and time-consuming IEP goals over the years and performed them to the best of their ability. And, now your son or daughter is a high school graduate. This calls for a huge round of applause. The philosopher Friedrich Nietzsche said “that which does not kill you makes you stronger.” And you’re probably thinking to yourself, that old Friedrich never had to handle the challenges and responsibilities of raising a special needs child! However, there is some truth to this saying. Because of your son or daughter’s journey, you’re likely a more compassionate, strong, confident and self-reliant person. That’s not to say there were no periods of anger, resentment, hopelessness or frustration along the way. You may have uncovered or developed abilities that you never thought or realized you had. Who knew you were a Special Needs Warrior, who will fight to the end for your child? Just know, these essential skills will carry you through the next phase of the journey – your child’s adulthood. But this time around, you won’t be a novice. In fact, it’s just the opposite. You’re a seasoned pro! “Been there, done that” may become your new motto. More importantly, you’re still standing. And after all you’ve been through, you deserve a gold medal. Nobody may ever carve a statue of you or name a street after you, but being a great parent always has to be its own reward. So, along with the cake, decorations and food, be sure your graduation party package also includes big helpings of pride in your child’s accomplishments, confidence in your abilities as a parent, and determination to continue building a great life for your family. Celebrate with joy and hope – you and your child deserve it! Deanna Picon is the founder of Your Autism Coach, LLC, which provides personalized guidance, comprehensive support programs and seminars for parents of special needs children. Her personal mission is to empower parents as they advocate for their children, while balancing productive work and family lives. She received her BA in psychology and BA in broadcast journalism from Syracuse University. Deanna is a parent of a non-verbal, young man with autism. She is the author of “The Autism Parents’ Guide to Reclaiming Your Life.” Deanna can be reached at www.YourAutismCoach.com or @yourautismcoach.